Eadweard Muybridge’s Abe Edgington (1878) is one of a number of 19th-century images that attest to photography’s potential for capturing truth, time, and movement. In the 19th century, one by-product of industrialization was an increased awareness of time. It dictated daily life: it was carried in the pocket and on the wrist; it was clocked at the factory. Trains transported goods and people at ever-faster speeds. The century saw the growth of the field of statistics, a discipline that rationalized and predicted contingency. It was at this moment that Leland Stanford, a California railway magnate and politician, commissioned San Francisco–based landscape photographer Eadweard Muybridge to record the galloping of a horse. (Stanford was interested in finding out how to breed faster racehorses.) Around 1872, Muybridge pioneered a technique using multiple cameras triggered in quick succession, allowing him to document the gait of Stanford’s horses in isolated phases. The resulting images helped settle a matter of much debate among equestrians, scientists, and artists—they proved that a horse is completely aloft at one point in its stride. His photographs were received with excitement, demonstrating the medium’s potential to capture truth. Stanford went on to reproduce and distribute them widely in books, science journals, and exhibitions. Muybridge’s work contributed not only to scientific and industrial progress, but also to the fine art tradition. In Abe Edgington, an 1878 photograph of one of Stanford’s racehorses, Muybridge achieves rhythm by creating a classic pictorial composition within consistent grids and presenting dynamic contrasts between light and dark. In photographs of dance or human movement, such as Untitled (woman leaping) (1887), which is currently on view in the University Teaching Gallery, he clothes models in drapery to accentuate ripples of fabric, just as a painter would. Such beautiful images helped ease the tensions viewers might have felt about photography serving strictly utilitarian ends. 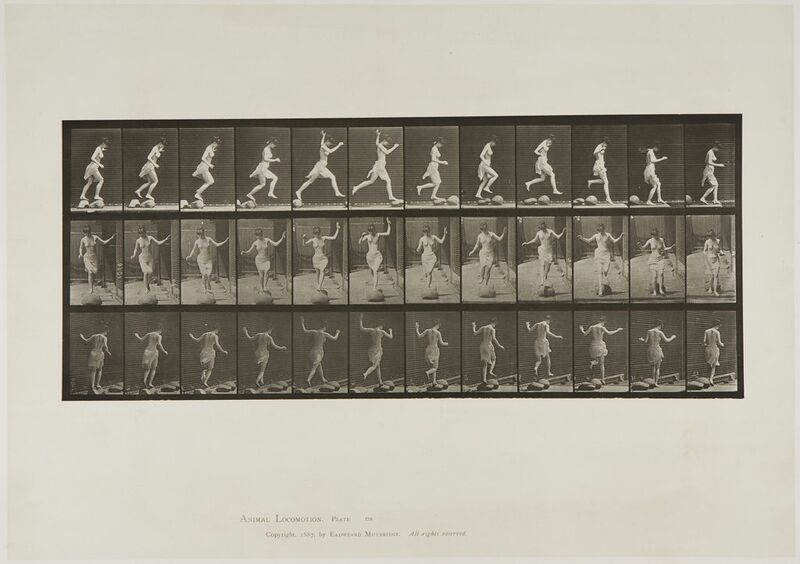 Muybridge fast became a celebrated photographer of the “instantaneous,” producing tens of thousands of images for scientific, entertainment, and artistic purposes. The medium’s formal aspects influenced painters and sculptors who studied the anatomy of motion, and avant-garde artists (particularly the futurists) who mimicked photographs to express the dynamism of varying perceptions of time. P1982.337 Eadweard Muybridge, Untitled, 1887. Collotype photograph. Harvard Art Museums/Fogg Museum, Purchase through the generosity of Melvin R. Seiden, P1982.337. In France at roughly the same time, physiologist Etienne-Jules Marey was theorizing about the idea of the human body as a machine, seeking to understand how its parts worked in tandem to allow walking, running, and jumping. He saw Muybridge’s photographs and wondered whether he could similarly express movement as continuity, as with the graphs he had been plotting to study respiration and circulation. Although his work was in dialogue with Muybridge’s, Marey was first and foremost a scientist, ambitious to make the world visible, measurable, and understood. While Muybridge’s technique produced individual images, Marey designed and built a camera that recorded multiple images on a single plate, from a single point of view. The result was an undulating pattern of overlapping segments: limbs or wings graphed in a passage of time. Marey called this process chronophotographie, emphasizing that it was time made visual. Marey’s 1890–91 photograph Untitled (horse [cob] walking), illustrates his excitement in the formal, abstract beauty of images. He often denaturalized his settings by using dark backdrops, white clothing (or horses), and reflective strips stuck to limbs in order to heighten their graphic simplicity. By the end of his life, he had made visible even the most ephemeral flows of water and air. His studies of bird flight influenced the aviation industry, and his analysis of human motion was applied to workforce management. 2012.198 Etienne-Jules Marey, Untitled (horse [cob] walking, 1890–91. Gelatin silver print from film negative. Harvard Art Museums/Fogg Museum, Richard and Ronay Menschel Fund for the Acquisition of Photographs, 2012.198. The work of Muybridge and Marey laid the groundwork for filmmaking. Muybridge experimented with animation, arranging photographs inside a spinning drum, and Marey’s single-lens, slotted disk shutter camera was studied by early cinematographers as a proto-cinematic device. In 1895, the Lumière brothers screened their first films, each lasting a few seconds and capturing street scenes, workers leaving a factory, and a racehorse. As the century drew to a close, movement that had been fixed in place by photographic processes began to be reanimated as movies. 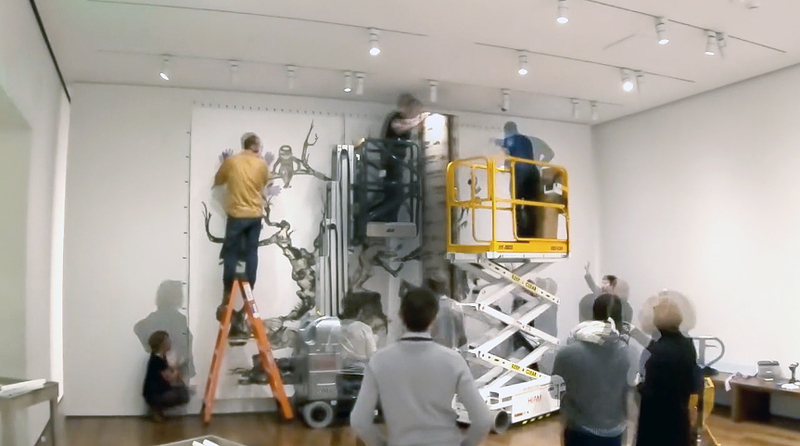 The impact of Muybridge’s and Marey’s work reverberated in other aspects of society. Researchers used Marey’s chronophotography to abstract animals and humans into sequential shapes, often to study how locomotion could be made more efficient in the workplace. Regulatory drives to control the body also eventually led to the photographing of criminals and their organization by face type. With such precise mechanical registration, the body became embroiled in scopic regimes of control. For the philosopher Giorgio Agamben, whose essay “Notes on Gesture” (1992) discusses the traumatic arrest of human gesture by photography, Muybridge’s work is paradigmatic. Gesture is not just movement, he argues, but a corporeal signature, an individual gait. One can imagine how unnerving it might have been for early viewers to see images of such subjectivity captured and printed. Film and video are usually considered time-based media, but so too are photographs. More than images of animals and people, Marey’s and Muybridge’s photographs represent time itself. Whereas once there was no consistent way of recording fluctuations of the body, or of understanding the mechanics of land, sea, and air locomotion, today’s devices can routinely pause, slow, accelerate, and replay motion. Marey and Muybridge contributed to this radical re-vision of time and movement. Looking at their photographs as timepieces, we can measure their era’s profound effect on our own. 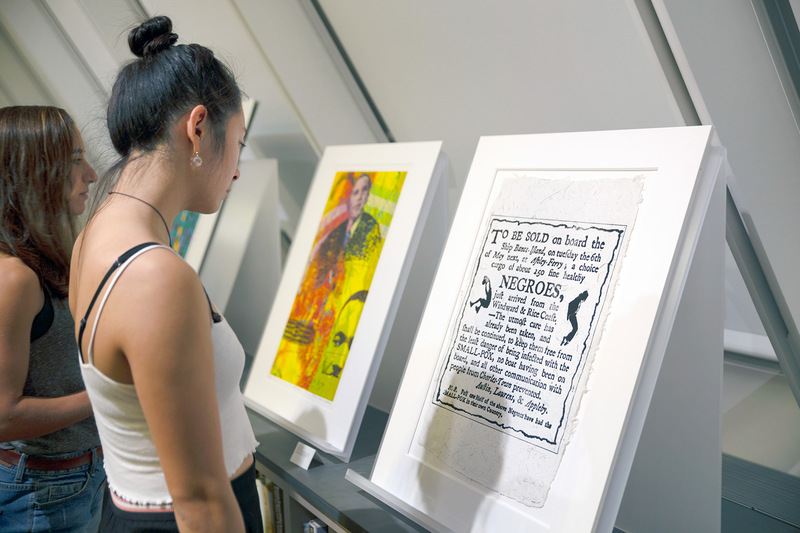 Becca Voelcker is a Ph.D. student in film and visual studies at Harvard University and an intern in the Division of Modern and Contemporary Art at the Harvard Art Museums.